Mount McLaren lies somewhat to the east of the main Flathead Range and, unlike the peaks of the main range, has a rather gentle east slope. In 1881, Senator Peter McLaren, a lumberman from Perth, Ontario, purchased a small lumbering operation from John Kean on Mill Creek. His company's busiest time was during the construction of the Crowsnest Pass Railway in 1897 and 1898. Peter McLaren Lumber Company had the contract for ties and all along the right-of-way, his loggers hand hewed the numerous Douglas Firs in advance of the track layers. 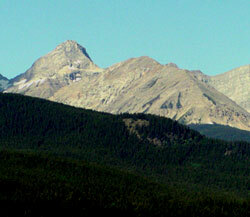 Mounts McLaren, Mount Parrish, Andy Good Peak, and Mount Coulthard form a semicircle which contains the headwaters of North York Creek. In the upper reaches of this cirque are the entrances to a major cave system within Mount Coulthard. In addition the remains of a Royal Canadian Air Force DC-3 aircraft can also be found. It was on a flight from Comox, BC to Greenwood, Nova Scotia and was lost on January 9, 1946 when it struck one of the peaks of the Flathead Range killing all seven aboard. Rescue crews took several days to locate the crash site and then ten more were required to remove the bodies on toboggans.